What did Trevor Sinclair make of it? Commentators Steve Bower and Trevor Sinclair were LIVE taking your questions after the final whistle. Watch what they think of England's chances in Saturday's final, and whether Liverpool have struck gold with Rhian Brewster. Anyone for a World Cup final? Go on then. You can watch it live on BBC Two on Saturday and we'll have live text commentary for you on the BBC Sport website. What an achievement, great performance. I said at the start I hope England play the game and not the occasion and they certainly did, they executed what they needed to on the pitch. Brewster will rightly get the headlines for his brilliant hat-trick but Foden was the man of the match for me, he dictated the game. It's brilliant for the coach, Steve Cooper, he's had the boys away from their families for a month and the reward is a World Cup final. Steve Cooper's side have done it, and they have another Rhian Brewster hat-trick to thank. The Liverpool striker scored three times in the quarter-final against the USA, and has bagged all three in the semi-final against Brazil. Plenty of smiles, hugs, high-fives from the young England players. They'll be back on Saturday for the final to face the winners of the other semi-final between Spain and Mali. And that's it. England are into the Under-17s World Cup final! A huge effort from the Young Lions! I think every England player is now behind the ball. There's no need to commit themselves or do anything silly. Steve Cooper's side are defending well. I think it shows how difficult England are to break down when Brazil are resorting to 30-yard shots. There are some tired bodies out there in the England side though and hopefully they will be able to get ready for the final on Saturday afternoon. Daniel Hiorns: Has someone been listening to a little too much 90’s Alan Hansen? England just sitting in now, keeping it tight. And who can blame them. They're restricting Brazil to the odd long-range effort. No bother for Curtis Anderson. BBC App users may need to click the link to view the full tweet. A World Cup final within touching distance. So can England win the Under-17 World Cup final? Is English football finally flourishing? And can Rhian Brewster solve Liverpool's problems? You can pose these questions and more to Trevor Sinclair and Steve Bower, who will be LIVE after the game over on our Match of the Day Facebook page. 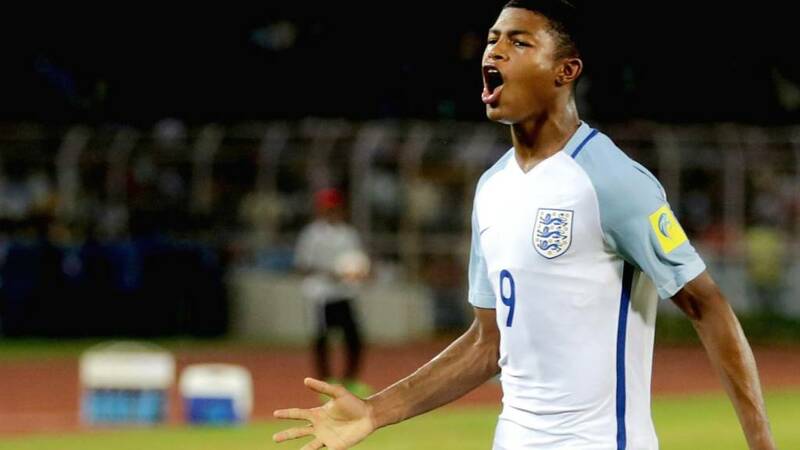 Watch the moment Rhian Brewster completes his second hat-trick in successive World Cup games. Strong running from Emile Smith Rowe. He skips into the Brazil half and stretches the opposition defence, before turning back and keeping the ball. It seems like Brazil have accepted they are not quite good enough for this England side. I think it is the shape of England they can't get past. Foden does a lot of work off the ball, he works his socks off and that's what youngsters have got to remember, it doesn't just happen for you. FOUR MINUTES FROM A WORLD CUP FINAL KLAXON. England looking to slow it down now, Philip Foden goes off after a superb display to be replaced by Nya Kirby. Daniel Barnes: Why does everyone think these youngsters can cut it in the Premier League after playing well in an U17 tournament? Come on guys. Foden is playing at the top of his game. His balance, his ability to go either right or left is absolutely brilliant to see in a young player. Brazil look out of gas. They're running on empty, and that's testament to this England team. The South Americans came out flying in the first half, but England's fitness and desire has shone through. Brazil are keeping the ball in midfield, but there is a wall of white in front of them and it's proving impossible to breach.